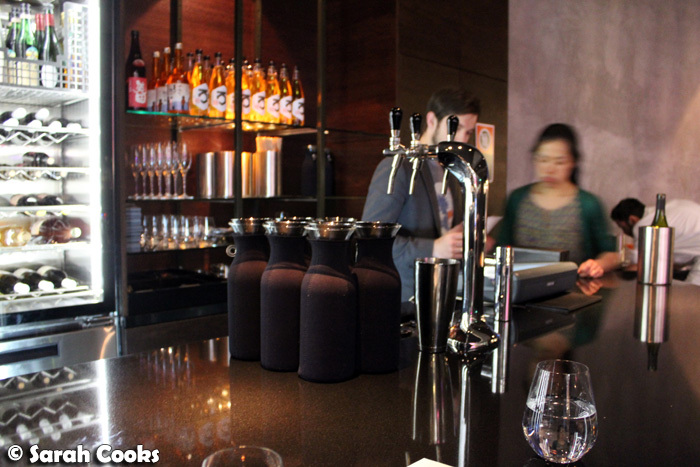 First stop on our Sydney weekend was the bar at Momofuku Seiōbo. Of course I was aware of David Chang's Momofuku and its various incarnations and offshoots - the New York restaurants, the Milk Bar bakery, Lucky Peach magazine, the cookbooks, the Crack Pie, the famous pork bun - but prior to this, I'd never actually eaten, read, cooked or experienced anything Momofuku. Momofuku Seiōbo only offers a "constantly-changing" set menu, and whilst I was totally keen to try out the restaurant, I didn't really want to lock myself into a $175 thirteen-course dinner, especially as we weren't going to get to the restaurant until about 8:30, dependent on flights and traffic. I must admit I was also put off by the difficult booking system - basically you have to book online, and you can only book ten days in advance. (Kinda like buying concert tickets - see their website for more details.) 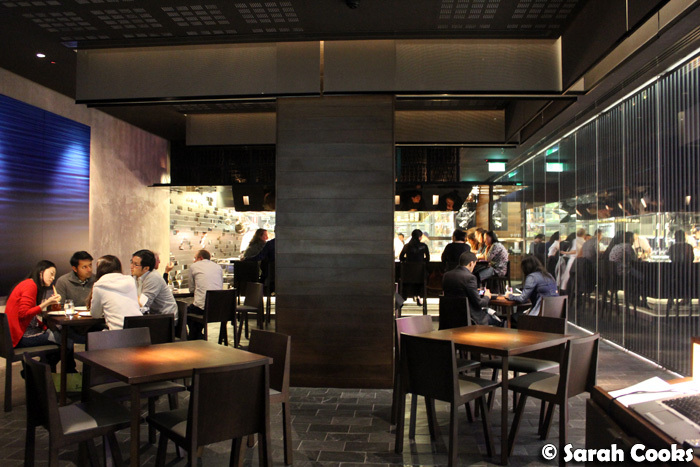 I also instinctively shy away from restaurants that are even remotely hyped up - and I guess you can't really get more hypey than "Australia's Hottest Restaurant"! from 7pm–10:30pm monday-saturday, and 12:15pm—2:30pm friday and saturday, we offer a limited bar menu at our 5-seat bar (walk-ins only). 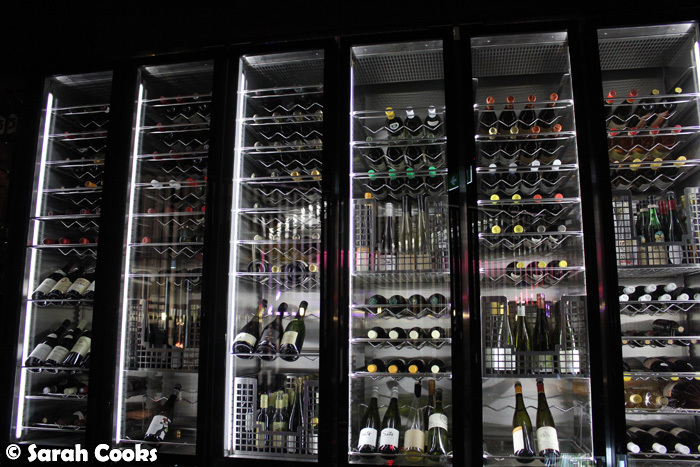 the bar menu, different from the tasting menu, ranges from AUD$4-25 and features snacks that we like to eat while drinking. ... and thought it would be a good way to dip my toes, cautiously, into the Momofuku waters. 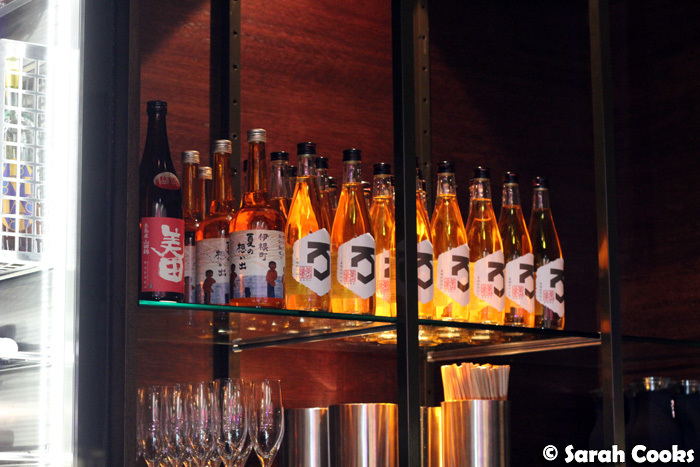 Aside from that paragraph on their website, I struggled to find any other info or impressions of the bar at all - the bar menu isn't online, and everyone I know who's been has gone for the full set menu (see I-Hua and Sofia's blogs for two great blog posts!) So I was a little nervous selecting the bar as our location for our Friday night dinner, especially as I was bringing An and Sandra along with me. Would we be able to get a seat? Would the food be in tiny, expensive, portions? Would the staff be too-cool-for-school and / or militantly enforcing all the restaurant's rules? You know what? I needn't have worried. It was easy to get a spot at the bar, the food was good (and filling! ), and the staff were chilled out and friendly. Phew! When we arrived at about 8:30 on a Friday night, there was only one seat (out of five) free at the bar, but we were told we were welcome to stand, which we were happy to. And when the couple next to us finished up, we moved into their seats. Too easy! Water (still or sparkling) is complimentary - they only serve tap water, which they carbonate themselves using those funky taps, above. (They look a lot cooler than the Soda Stream we have at home, hah!) I actually prefer sparkling water, but always order tap water at restaurants, because I hate seeing a big fat charge for water on a bill at the end of the evening. So I was thrilled that the sparkling water was free! I am Asian, after all - don't judge me, love me. Here's what the restaurant looks like - despite the dark and grey colours, and all the hard surfaces, the effect was warm and it didn't get too loud during the evening. Now that I look back at the photos, it strikes me that there were a couple of tables free, even though it was a Friday night - I wonder if they were no-shows, or if they hadn't been booked at all. They do accept walk-ins for lunch and dinner for un-booked tables, so if you happen to be in the area, why not try your luck? (Disclaimer: No guarantees, this night might not be representative of ordinary levels of business, don't blame me if you can't get a table). I was thinking of ordering wine or a cocktail, but this really is beer food! (There isn't a cocktail list itself, but they can make classic cocktails or mixed drinks - martinis, Americanos, old fashioneds, that sort of thing). There's a short list of snacky bar foods, and you tick the back of the menu to order. We ordered pretty much everything (except the pickles and pickled egg). I'd been umm-ing and aah-ing over one item, unsure whether to order the "spicy roasted rice cakes, tripe", until An decisively said: "we don't know when we're coming back here, let's just get it!" and ticked it. Legend. This is why we are friends! The food just seemed to come when it was ready, brought out by the chefs themselves. 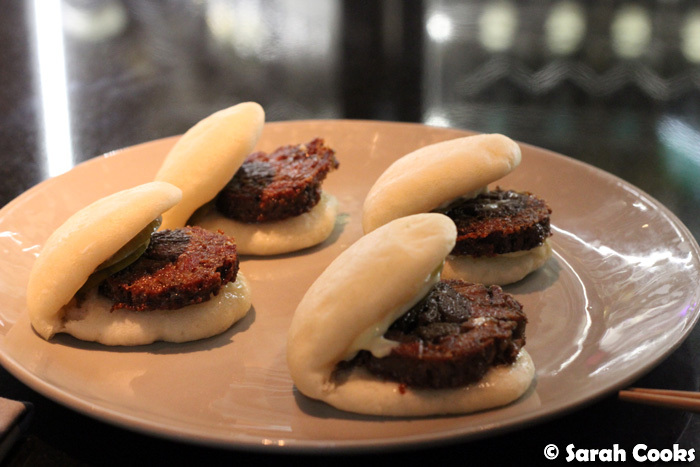 The first thing to come out was the beef cheek buns - soft little steamed mantou buns, folded to enclose pickles, kewpie mayo and a circle of beef. These were gorgeous! I loved the combination of flavours, and the beef had a lightly crisp exterior, giving way to a meltingly soft centre. All three of us loved these. The night was off to a good start! 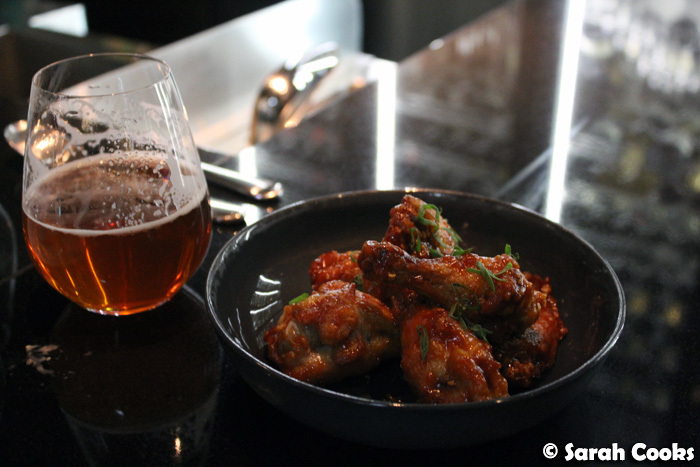 The chicken wings were lovely and soft, with a slightly sticky, spicy coating. They were a little messy to eat, but very very tasty. 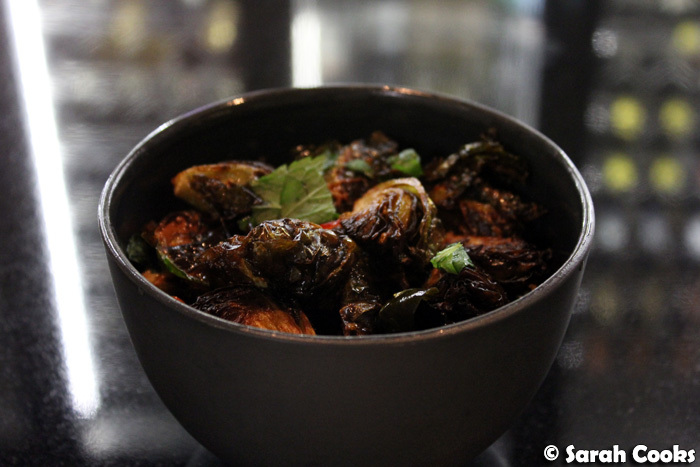 The Brussels sprouts came highly recommended by our waitress, as something we had to order even if (especially if!) we hated Brussels sprouts, as they were guaranteed to taste unlike any other Brussels sprouts we'd ever eaten. I actually have no issues with Brussels sprouts, so was more than happy to give them a go. The little sprouts (I like to call them "mini cabbages", like the Japanese do) had been quartered and deep-fried, so the individual leaves were all crispy. Crispy! They were also coated in a salty fish sauce vinaigrette - to be honest, it was a little too salty for my salt-averse taste buds, but we couldn't stop eating them - they were as addictive as crisps. Great drinking food. Crab roll! You know I love New England-style lobster rolls - I made them twice last year; once as part of a luxurious pre-Christmas dinner, and once for a dedicated lobster roll dinner! I also love crab, so I was very excited about this crab roll! 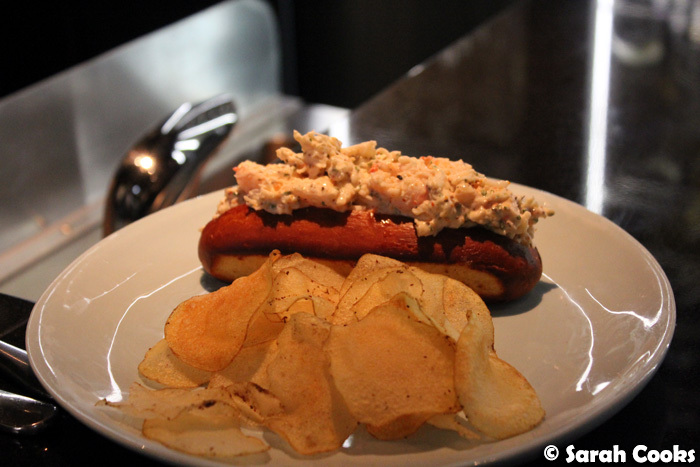 It was your basic American crab salad (crab meat, mayo, spices, possibly finely diced celery), wodged into a toasted brioche bun, and served with crisps. Heaven! At $22, it's pretty expensive, but there was a lot of crab in that brioche bun! Almost too much crab for that amount of bread - not that we were complaining! I know from experience that picking crab meat is a difficult, fiddly, P in the A procedure, so I think the higher price is justified. And now, the famous pork buns! 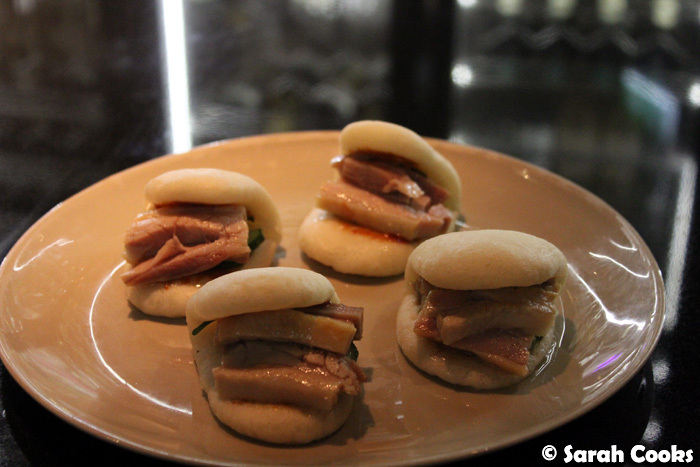 Similar in structure to the beef buns, these little babies are comprised of a soft mantou bun, wrapped around tender, fatty, slices of pork belly, with hoisin sauce and pickled cucumber. Delicious, but controversially: we all liked the beef buns better. Whilst the beef buns had been warm, the pork buns were actually tending towards the cold side of lukewarm. (Yes, we were faffing around with the camera for a minute, so perhaps they had been warmer when they came out, but obviously we'd been doing that with every other dish and we didn't have any temperature issues). I did love the combination of flavours and textures in the pork buns, but if they'd been served hot they would have gone to the next level of awesomeness. For some reason, when I read "spicy roasted rice cakes", I pictured something like crunchy senbei or rice crackers, but these were thick and chewy Korean-style rice cakes. (You know, the type you might get in a spicy red sauce with fish cakes and noodles at a Korean restaurant). The sticks had been roasted, and had a light crunch on the outside, whilst still majoring on the stodgy dough - which I loved! Doughy goodness makes me happy. 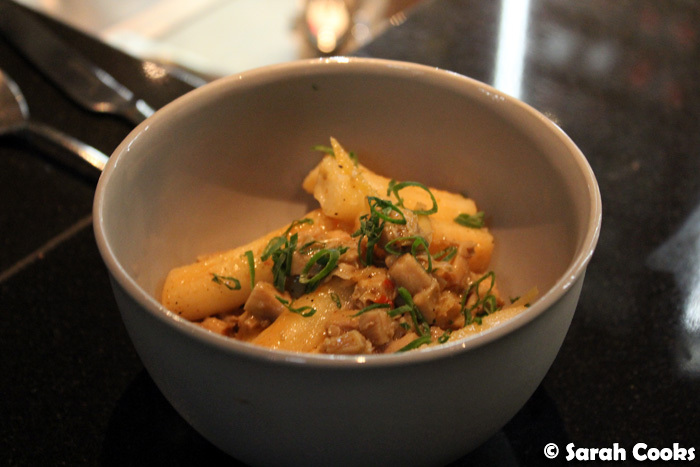 I thought of these as a cross between mochi and Schupfnudeln, dressed in a pleasantly salty tripe dressing. Tripe really isn't my thing - I never order it at yum cha - but here it just tasted like tender little pieces of meat. Very nice! 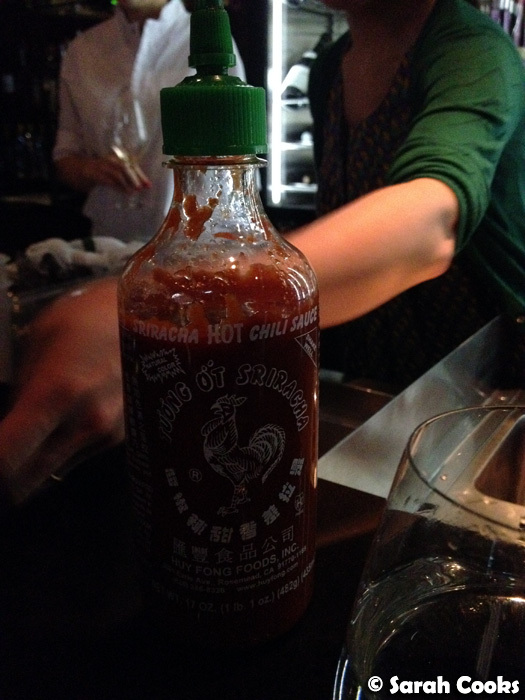 So, for all my initial trepidation, we really enjoyed the Momofuku bar. I loved the food, loved the ambiance, loved the service. I hear through the grapevine that the staff do enforce the rules (mainly: no flash photography and no phone calls inside the restaurant), but I can't stand flash photography or noisy phone calls in restaurants, so I think this is a Very Good Thing. Besides, all the rules seem to be in place to try and ensure that the system is fair and that everyone can have a pleasant time, rather than to enforce some kind of faux-exclusivity. Dinner at the bar was definitely on the pricey side - $142 for the three of us, including only one drink - but the food was all made from high quality ingredients, prepared in unusual and exciting ways, and crucially, we got a good feed and left full. 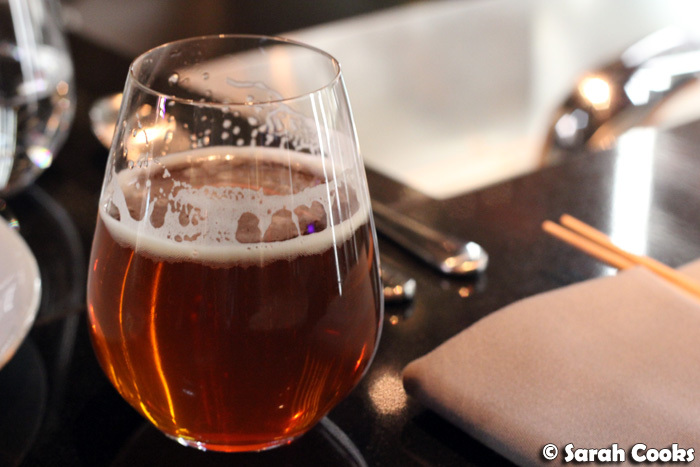 Based on our experience at the bar, I think it'll definitely be worth it to brave the online reservation system and go the full thirteen courses on our next trip to Sydney! This is the second post in my 2012 Sydney Trip series. Those rice cakes look so wonderfully amazing. Chewy goodness! Great post Sarah. Couldn't find any info about the bar food. Thank goodness for your post. Heading to Sydney for a short 4 day weekend and definitely going here now. Winston - Thanks so much! Really appreciate your comment. 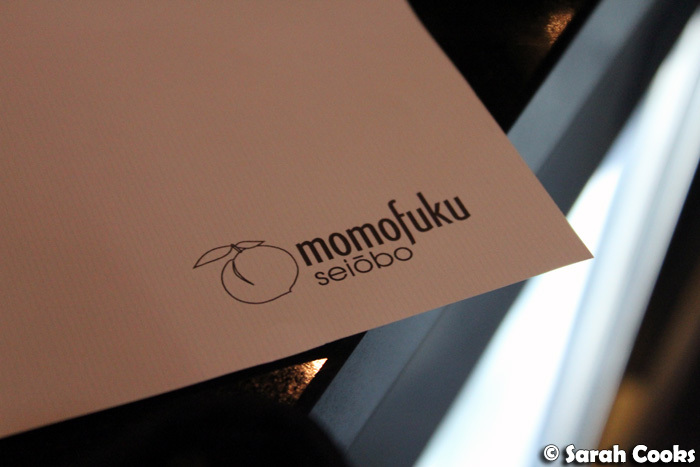 I hope you do enjoy Momofuku next time you go up to Sydney! Michelle - It's definitely worth a visit! Hannah - OMG I KNOW. Chewy doughy goodness forever! Thanh - Thank-you so much! I had the same issue before I visited, so I was hoping my post would be helpful for people interested in just eating at the bar. Have a great weekend, I hope you have a fun and delicious time!! Looks utterly souless and it is also in a Casino....not cool. There's amazing Korean at places like Sydney Madang on Pitt plus loads of rocking Asian places to eat. Din Tai Fung dominates the dumplings too.